Comey said Trump had raised the sensitive FBI probe into Russia's alleged meddling in the US election in multiple discussions. 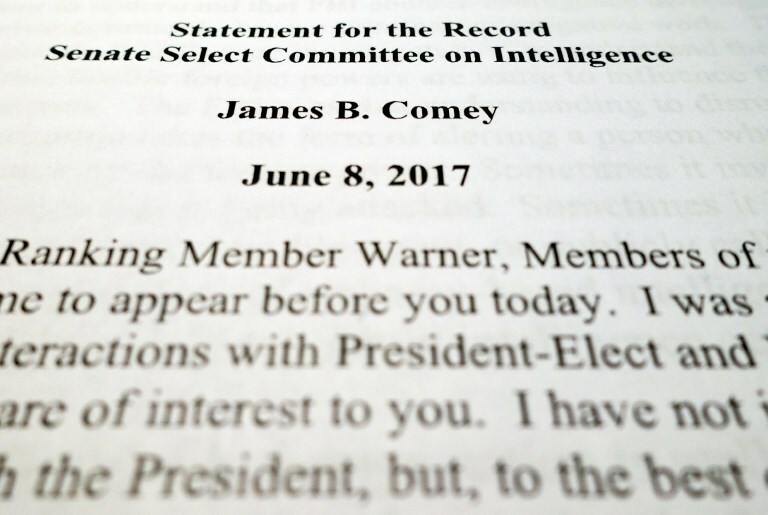 A photo on June 7, 2017 shows the "Statement for the Record" released by the Senate Select Committee on Intelligence of former FBI Director James B. Comey, to be read June 8, 2017, at a hearing on Capitol Hill in Washington, DC. Fired FBI director James Comey said Wednesday that Donald Trump urged him to drop a probe into former national security advisor Michael Flynn, prompting fresh allegations that the US president tried to obstruct justice. In a bombshell revelation on the eve of his hotly anticipated appearance on Capitol Hill, Comey said Trump had raised the sensitive FBI probe into Russia's alleged meddling in the US election in multiple discussions, leaving him deeply uneasy over whether the president was attempting to interfere. "I hope you can see your way clear to letting this go, to letting Flynn go. He is a good guy," Comey quoted Trump as telling him on February 14 as they sat alone together in the Oval Office, in prepared testimony for Thursday's Senate hearing. "I had understood the president to be requesting that we drop any investigation of Flynn in connection with his false statements about his conversations with the Russian ambassador in December," added Comey, who was fired by Trump in early May. However, Trump felt "completely and totally vindicated" by the written testimony, his private attorney said, as Comey confirmed he had told the president he was not personally under investigation. Comey also said Trump demanded a pledge of loyalty in a meeting on January 27, just days after the Republican billionaire took office under a cloud of allegations that Russia's interference had helped him win the election. "The president said, 'I need loyalty, I expect loyalty.' I didn't move, speak, or change my facial expression in any way during the awkward silence that followed," Comey said. Neither Director of Intelligence Dan Coats nor National Security Agency chief Mike Rogers denied the Post story. But both said they never felt "pressured" to act. "I've never felt pressure to intervene or interfere in any way with shaping intelligence in a political way or in relationship to an ongoing investigation," Coats said. 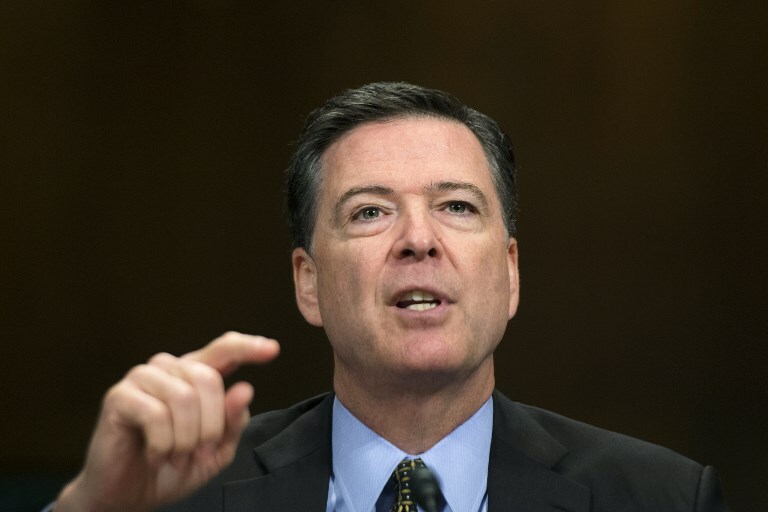 This file photo taken on May 3, 2017 shows FBI Director James Comey as he testifies before the Senate Judiciary Committee on Capitol Hill in Washington, DC. Trump began the day by announcing his new nominee to lead the FBI -- Christopher Wray, a career white-collar crime attorney and former Justice Department official under former president George W. Bush. Wray's nomination must be confirmed by the Senate. Trump fired Comey on May 9, expressing deep frustration with the continuing investigation into whether members of his election campaign colluded with a covert Russian operation against Trump's rival Hillary Clinton. In the wake of the firing, the Justice Department named an special prosecutor, former FBI director Robert Mueller, to lead the government's investigation. Comey did not say whether he thought the president's actions amounted to obstructing the investigation -- an issue lawmakers are expected to highlight Thursday in their questions. "I could be wrong, but I took him to be focusing on what had just happened with Flynn's departure and the controversy around his account of his phone calls," Comey said. "Regardless, it was very concerning, given the FBI's role as an independent investigative agency," he added. At the same time, Comey recalled that in a March 30 phone call, Trump asked Comey how to "lift the cloud" of the overall Russia probe that made it difficult for him to lead the country. Lawmakers said Thursday's hearing will focus on whether Trump was obstructing justice -- the charge that led to Richard Nixon's resignation in 1973. Asked if Trump had acted appropriately, Republican Senate Intelligence Committee chairman Richard Burr said: "I don't think that from what I've read there's anything of wrongdoing, but I will match that with his verbal testimony, and weight it against the evidence of our investigation to date." Democratic Congresswoman Kathy Castor said in a tweet that Trump's demand of a loyalty pledge "looks like obstruction." "The question really is not whether the president has obstructed justice," he said. "The question really is whether the president can obstruct justice with impunity."